Nine years ago today, my now-husband, Evan, asked me to pursue a relationship with him. He was someone I met in the most traditional way. Yes, we were introduced by our parents. Having a rather wide age gap at the time (he was 23 and I was 16), we had nothing in common and nothing to talk about. But we are a happily married couple now, entering five years of wedded bliss in two months! Thinking back, many incidences that occurred prior to our first meeting were so random, that only God could orchestrate. To be able to finally meet each other for the first time was none other than God's miraculous plan. It was not a coincidence. It was a divine appointment and blessing. Evan just resigned from banking and has been accepted to a university in the Bay Area to do his master's. He went back to Jakarta in the summer of 2003 to apply for a student visa for Fall 2003 enrollment. But his visa didn't come in time and he had to postpone enrollment until Winter of 2004. Having lived outside of Jakarta all his life, he had few friends and spent most of his time accompanying his Dad to and from work everyday for several months. 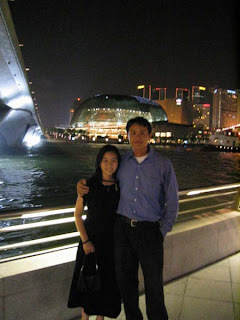 I just finished high school in 2002 and was waiting for my sister to finish hers in 2003 before going to a university in the US, while in the meantime I started community college in Singapore. We were interested in a few places in the US but were nervous because we knew no one. One day, a friend who was studying at a community college in the Bay Area came to visit and told me good things about the place and was willing to help us out with school application. After talking to my parents and doing some research, it turned out that it is a nice area and we found out we knew some people there, and to top it off, my cousin would join us if we decide to go there. Long story short, it was a quick decision, we were accepted to the community college in the Bay Area for Winter 2004 enrollment. I didn't know Evan at the time. Evan's Dad and my Mom worked in the same company. When my Mom went to Evan's Dad's office one dat, she saw his family picture. She asked if Evan (the only unmarried one) had a girlfriend and he said no. When I went back to Jakarta for summer holiday, they arranged for us to meet (just the four of us!) in a buffet restaurant in a mall by their office. As awkward as it was, there were many funny (and memorable) things that happened that day and the few days after (but I'll spare you the details). It was then when we found out that we were both going to study in the Bay Area starting Winter 2004. Over the next several months, we kept in touch through emails. Having not much to do while waiting for his visa, Evan would respond fast to my emails and helped me edit my essays. I started talking about random things in life like what I do everyday and I suppose he found it amusing because he never got bored of my randomness in my emails (haha). Fast forward a few months later, we were both in the US, got to know each other better and we started our courtship on April 19, 2004. The rest is history-in-the-making. You see, it was almost impossible for us to meet if it wasn't God's plan. Evan never lived in the places I lived in, he was considerably older and had different circle of friends who enjoyed to talk about politics, history, and philosophy. He was smart, tall, dark, and handsome (ok maybe I'm biased, but it's true!) who had traveled the world, graduated from a top university, and had worked for two years. I, on the other hand, was only sixteen, having just finished high school, never been outside of Asia and Australia, and loved to talk about... well, randomness of life. I was just starting out. Our circle of friends were so different and we liked to do different things. At a glance, we had nothing in common. There were also many incidences in 2003 that could have happened that would not allow us to meet. Evan's visa could have been out on time and he would have gone to the US earlier. I could have gone to a different university if it wasn't for my friend who came to visit. We would not have met if my Mom did not notice his family picture in his Dad's office. And so on. But nothing is impossible in God, and more importantly, our "nothing in common" was a non-issue because we both believe in God. God unites us. And throughout our relationship, we talked about how to deepen our faith and encouraged one another to live according to God's ways, all of which are far more important than knowing (or not knowing) about politics, economics, or geography. Our faith in God was the building blocks of our relationship and the foundation of our marriage. Having God as the center of our marriage strengthens our relationship. We love each other because we love God. We don't want to hurt each other because we fear God. And we don't want to sin against one another because we are accountable to God. Happy nine years, E! I love you more each day and I'd say yes all over again! Happy Anniversary you two! I especially love the last paragraph. May you continue to grow in your faith and love. We're blessed to know you. Thanks, Ci! We're blessed to know you too! Happy anniversary Vicky and Evan! I love your story. So touching!